Why is the Shinai Longer? Hello, Imafuji sensei. My question today is just for curiosity's sake. Once Kendo was originated from Kenjutsu, why do we use a shinai much longer than an average katana? Once I read a sensei's text saying that in Kendo we should begin with the normal "39 size" shinai (or 38 for women) and then, after you become a high graduated kenshi, you should bit by bit change for shorter shinai. Is it accurate? For what reason? Another fact that makes me curious is: In Brazil we had Kimura sensei, a very dignified sensei from Japan. He was offered the hachidan title but refused it, and practiced until his death in 2008, aged 92. He was a "shinai-maker" himself, and he liked to use a '37 size' curved shinai because it was more "similar to a katana", in his own words. As always, thank you for your kindness and sharing your wisdom! Answer: Thank you for your question! Kendo was derived from Kenjutsu. And a long story short, after bogu and shinai were introduced, kenjustsu practitioners became more sportified or “shiai” oriented and started inventing their own techniques and modified their shinai. Some of them made their shinai really long even though the different schools had their own theories and rules even on the length of the sword. Why? To win, of course. memory is correct, the length was decided to 38. Why? Not sure. Why 39 now? I heard that the Japanese got taller. I am not sure why it became 39. My personal experience with shorter shinai is not really good. If you want to use the shinai with the same length as the katana, the shinai is too light. The length of my iaito is 106 cm and it is almost the same as 34 shinai. But it weighs about 1kg. Not sure how much weight 34 shinai is but it is probably around 300g. 39 can be as heavy as 600g but cannot be 1kg. And we probably don’t want to constantly hit our friends with such a heavy material. 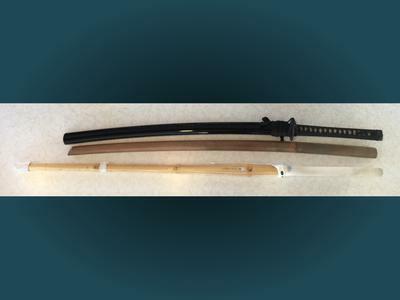 The katana lengthened shinai is too light for adults. I personally like shorter shinai so I cut my shinai to 38 or 38.5. But if I use 37 for chudan, it is too light. I could cut 39 shinai but then it is hard to get the right balance. For training purpose, I think we should use the shinai that matches to individuals. So if you think you need to use a shorter shinai you should. But if you want to participate in tournaments, then you should follow their regulations. You can and should use different types of shinai for your training purposes as well. But this is a different topic.